The political party of part-Maoris has, lashed out at NZ First over the way it has wrecked plans to pass five treaty settlement bills at a special sitting of parliament on Friday. In the media, Whinlayson, Brownlee and Fox were all vocally venting their spleens with Peters responding that they were an unsightly trio of drama queens. Two linked media reports below. What’s really worrying is the hints of corruption in some reported comments from Whinlayson. Viz. Finlayson had already written to the three iwi who had made travel plans for Wellington, promising to cover their costs for exceptional circumstances. These people are not going to suffer costs as a result, I’ll ensure they’re looked after. Will you indeed, Whinlayson? How? The idea that he would be personally paying is ludicrous. Whinlayson needs to be open and publicly forthcoming about where he plans to get the money from. If he’s rifling the public purse, then we’ll know . . .
Perhaps some 1Law4All member could invite the media to inquire of Whinlayson where he’s getting the money from and how he’s going to decide just who does and doesn’t get “exceptional circumstances” travel and accommodation booking expenses reimbursed? One thing’s for sure, those decisions will be 100% racist based! Amongst the weirdest aspects of Whinlayson’s behaviour in all these matters is – despite being a lawyer – he accepts hearsay* from part-Maori as absolute truth. Earlier this year, the travel plans of a 1Law4All member were disrupted when Parliament went into urgency and the cost of the flights to attend an aborted Select Committee Hearing were wasted. Could that 1Law4All member be “looked after” by the Treaty Settlements Minister for suffering that travel expense wasted money, perhaps? NZ First does not want race-based appointments taking hold in this country, NZ First Leader and Northland MP Rt Hon Winston Peters said today. “New Zealanders should be very concerned about the Taranaki Iwi Claims Settlement Bill – it hands power to iwi by giving them six decision-making roles on a local authority without being elected. “This law will force the Taranaki Regional Council to appoint six iwi members, three on the Policy and Planning committee, and three on the Regulatory Functions Committee. “They will not be elected, but nominated by iwi, need not be subject to an iwi vote, and they will be paid for by the ratepayers. “This is electoral apartheid. “All this is in Clause 31 of the Bill. “The clause in part comes from the Local Government Act 2002, but this government has changed a critical word which allows for racial preference without an election. “Instead of stating a local authority “may” appoint people from the outside, it states that the council “must” appoint members nominated by the iwi. This has been done by stealth. “The government and the Maori Party are in cahoots on this. “The perpetrators have the nerve to slide this under the noses of the people of Taranaki. “It was New Plymouth that gave a resounding “no” vote to creating a Maori ward on the local council. “It was a landslide with 83 per cent saying “no”. The Manawatu Bill creates an “Advisory Board” to the Manawatu–Wanganui Regional Council to provide advice in relation to freshwater management issues concerning the Manawatu River catchment. All that’s being revealed bears out the takeover by stealth of NZ’s fresh water by part-Maori interests and their government sycophants. A little here, a little there, until it all theirs and not yours. ∗ Hearsay: when a person asserts what somebody else said, when that somebody else is not available to confirm that assertion to be true. The MSM are not reporting the reason for Winston’s reluctance to pass the bills as they are i.e. the giving of seats on Regional councils as part of settlements. Who told this national government that they could offer a slice of democracy as a settlement? I was annoyed to hear that comment from Whinlayson – he obviously thought he had the authority to reimburse these part-Maori for costs which they incurred through their own decisions. Could we please be advised precisely what Whinlayson’s relationship is, and has been, to various tribes? Shouldn’t he be declaring a conflict of interest here? If this sort of thing continues from National, I will be tempted to support Winston next time around – and I won’t be the only one. As I understand it Findlayson was a lawyer for Ngati Tahu during their negotiations leading up to their 1996 5th Full and Final settlement. He made sure that there was a catch-up clause in there and when they came to activate that guess who was the minister they had to deal with – Findlayson. Is that corrupt or what? This is aman who has never been able to get elected and is a list member. Write to your local MP – I have and clearly he is not aware of what is going on. He has a gross conflict of interest. As said above he acted for Ngai Tahu and now he is not only the Minister for Treaty Settlements but also Attorney General so he can approve whatever he wants. He is doing deals in his office and not going through the Courts and no-one is allowed to challenge his decision. It’s all being done on reinvented history and is an almighty scam and creating a huge injustice for the rest of us. For me there is no other fitting word other than ‘treason’. Good on Winston. Let’s hope he keeps it up. The trouble is that he doesn’t have the numbers. I’m starting to warm to Winnie! There must be something more driving this process than the support of the Maori Party in keeping National in power. The prospect of forcing Maori representation on local Councils is a total perversion of the democratic process at the district level. While some might see it as some sort of PC justice in compensation for real or imagined injustices but it is fundamentally unjust. What is actually going on? This is blatant racism and flying in the face of what the people have specifically said they do not want. I had thought at first that Winston was just being belatedly dodgy in opposing these Bills as we weren’t told why. Now that we know what was proposed we must oppose it loudly and clearly. Absolutely agree with all the above comments. Keep up the good work or we will lose democracy … Actually I think we have in many ways… I believe we are losing out and apartheid is full and truly entrenched in our culture now. The problem with Winston First is that there is rarely anything done – it’s mainly just talk. Sometimes, (as in this case) Winnie acknowledges that there’s nothing that can be done as the gNats and part-Maori racists have a parliamentary majority. Well, not quite nothing. All that can be done is to make/cause a fuss. Whether or not the sheeple of NZ will take notice and do something is unknown. Don’t expect much help from the media in making the issue more widely known, either. That certainly is a problem – that he will get in and do nothing or next to it as he has done in the past. On the other hand with a topic like this the main parties – any party that has snowball’s chance – they are all for doing much the same to a greater of lesser degree. Democracy is surely if nothing else about choice and at the moment there is little choice – he brings just glimmer of hope at least and has my vote. I have been informed that National are now changing legislation to make it compulsory for all councils to have a Maori advisory board. This will mean that if there are 12 council members half of them will have to be Maori. Where has democracy disappeared to??? 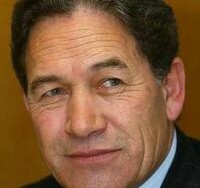 Winston Peters will be getting my vote from now on. When the people wake up and see what the National Party is doing to our country I would hope the people would hit National as hard as they can in the elections next year and wipe them right out to show that the people won’t put up with apartheid. The greens and labour won’t be any better I would sugggest that people vote for NZ First and 1law4all if we can get enough of these two parties in power and prehaps as Government what a good wake up call this could be. Sadly, not having a party leader even after this amount of time since the shambles of last election, will unfortunately mean that 1LAW4ALL will be a ‘failed’ party again unless something changes before the next elections. We lost our opportunity to make a difference when John Ansell and the then party board couldn’t work together. My partner and I lost hope then that the racist unequal direction our political leaders are imposing on the country, could or would be halted or reversed before they were entrenched. i have to confess that I now belong to the majority of Kiwis who are apathetic when it comes to politics despite knowing that ‘when society demonstrates apathy, leads to a dictatorship government’. With the Education curriculum being purged of any positives bought to NZ by colonists and the talk of destroying the ‘true Treaty’ our descendants won’t ever know NZ’s true history. It’s frightening to think of the country we are leaving for our great grandchildren; I’m glad I won’t be around to see it. PS: When I talk with others about NZ’s direction, no-one has yet come up with even ONE significant benefit Maoris have contributed to NZ today … they just go on about how Maori got taken advantage of. Instead of our weak government saying ‘sorry’ to today’s part-Maori for ‘historic wrongs’, how about a simple ‘thank you’ from part-Maori for the huge leap they made from being a stone-age civilization to one of technology by uniting with Europeans. I must agree with almost all of your policies. My one objection is to your continual use of the term ‘part-Maori’. Everyone through their genealogical past has the right to embrace the culture of whatever part of their ancestry they feel fits their lifestyle. Of course they do, Kenneth, but when there is money involved this motivates them to embrace a certain section of their culture they might otherwise not have done. You only have to look at many of them and they are vastly of ‘other’ culture, not ‘Maori’. This is what annoys people and why they are referred to as ‘part-Maori’ because many of them are in it solely for the money. If there wasn’t money in it, they wouldn’t bother. Of course people are able to embrace the culture that they want -this is NOT the issue. The issue is their ability to make money from that embrace. Some of the people who have mad huge amounts from the settlements are people with a very small part of their ancestry that is Maori. A good example is Stephen O’Reagan who has (it has been estimated) around 5% Maori blood-his father was an Irish doctor and yet he is reputed (by his Maori enemies) to have made a personal fortune of $4 million from the 1996 -5th full and final settlement that Ngati Tahu made. You are so right, Roger. I totally agree with you. It’s long overdue for all this racial privilege to be knocked on the head once and for all and for us all to be the same under the law.